While driving down a long, dusty road in North Alabama, towering stalks of corn inched away on my right and fields of soybeans lazily waved to me on my left. As they edged further and further in the distance, I became entranced by the jade landscape and was immediately reminded of the few fleeting summer days that were drawing further and further away from me. Summer has served me well with its beautiful, charming produce that never ceases to inspire, endless days spent reading and writing on the river and the ability to devour countless blackberry snoballs without feeling the least bit guilty. It’s been a good summer. So, in honor of its last few days, I made a heart-warming soup with summer gold as the star. Sweet white corn is gently cooked with aromatics, simmers gently for just a few moments, and then puréed to perfection. Farewell summer, it’s been golden. 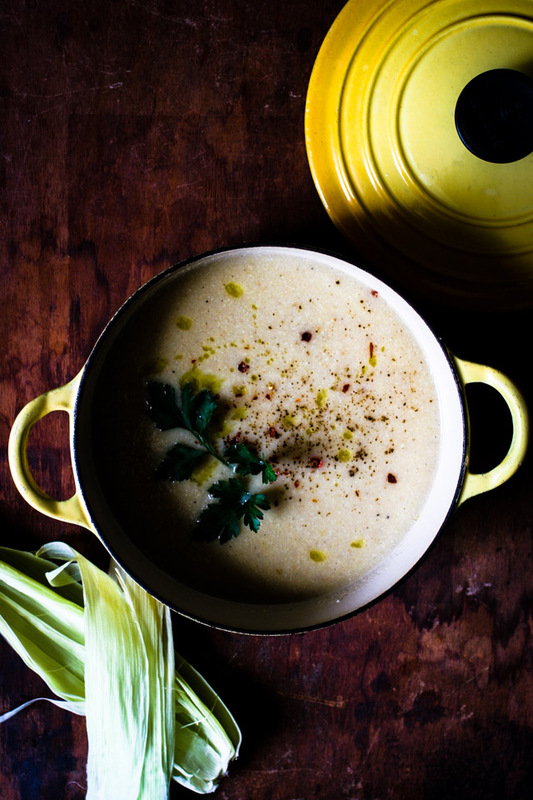 Note: If you want a smooth corn soup, just strain the soup after it has been blended and discard any solids left behind. Also, you can garnish the soup with sliced cherry tomatoes, slices of grilled avocado, tortilla strips or salsa if you like! Heat butter and oil in a medium-sized pot over medium heat. Add onion and garlic and cook, stirring often until the onion has softened and become translucent. Add sweet corn kernels, red pepper flakes and season with salt and pepper. Cook until the corn begins to soften. Add parsley sprigs and 2 ½ cups of water to the pot. Bring the corn mixture to a boil, reduce heat, and simmer until the corn is soft. Discard parsley sprigs. Using an immersion blender (or a regular blender), purée corn mixture and season with salt and pepper. Ladle soup into bowls and garnish with olive oil and parsley. Enjoy! Bumper crop of corn for North Alabama this year. Hooray! And hooray for this “golden” recipe!! Corn was extremely successful this year! Thank you so much! This sounds like such a delight! Lovely recipe! Thank you! My husband said it was like eating creamed corn, but I just giggled a little because it had no cream in it! The sweet white corn was naturally that creamy and full of flavor! 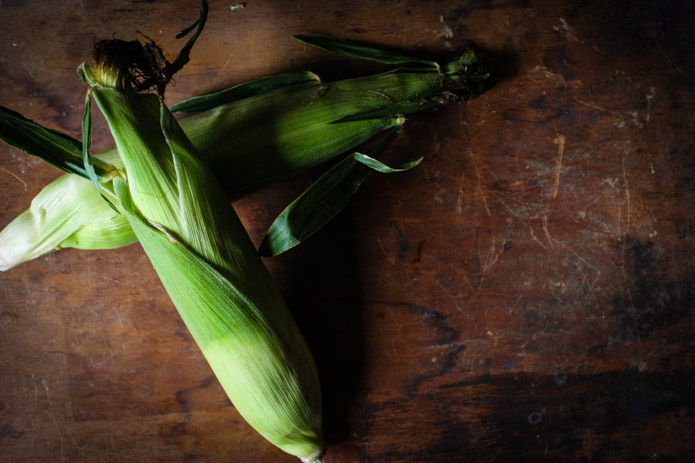 I will be spending the weekend in the corn fields of Indiana… can’t wait to share this recipe with my family there! Sounds wonderful! I hope you and your family has a lovely time in Indiana! This is such a silky looking corn soup. The recipe is so simple and I can tell it is something to write home about. You photographs are stunning too! Thank you! It was easy to make this wonderful soup look stunning!